Stakes are high for three-time Bharatiya Janata Party (BJP) MP in a row, Anurag Thakur, on Hamirpur Lok Sabha seat in Himachal Pradesh, especially after his father, former two-time Chief Minister, Prem Kumar Dhumal, lost the Assembly poll in 2017 despite being party’s CM candidate. Thakur, who has been a high profile politician, much in limelight and controversy, both for having headed Board of Control for Cricket in India (BCCI) and earlier Himachal Pradesh Cricket Association (HPCA), is seeking re-election in 2019 Lok Sabha polls. He registered a thumping victory in the 2008 by-poll defeating Congress party’s OP Rattan by a record margin of over 1.74 lakh votes. He won the Parliamentary poll in 2009 and then in 2014 with huge victory margins. He faced three different opponents of Congress, OP Rattan, Narender Thakur and Rajinder Rana, in three previous Lok Sabha elections, and is now pitted against a fourth new opponent, former Congress minister and MLA, Ram Lal Thakur, in 2019 Lok Sabha polls. Five-time MLA from Shri Naina Devi, Ram Lal Thakur, 67, was first elected to the Assembly in 1985 and has been a minister in Himachal government thrice. Ram Lal Thakur was pushed into Lok Sabha election in 1999, 2004 and 2007 (by-poll). In 1999 and 2004, he lost to BJP’s Suresh Chandel and in 2007 by-poll he was defeated by former CM Prem Kumar Dhumal (then leader of opposition in HP). Ram Lal Thakur, who too is from sports background (wrestling), hails from Bilaspur district while Anurag Thakur is from Hamirpur district. Hamirpur Lok Sabha seat includes Una district and three segments of Kangra, besides Hamirpur and Bilaspur districts. The BJP has retained Hamirpur Lok Sabha seat since 1998. The BJP is again confident in Hamirpur and is probably considering this as the strongest seat out of all the four Lok Sabha seats in Himachal in 2019. “We are sure of a victory in Hamirpur. The victory margin will be really high,” said state BJP chief Satpal Singh Satti. 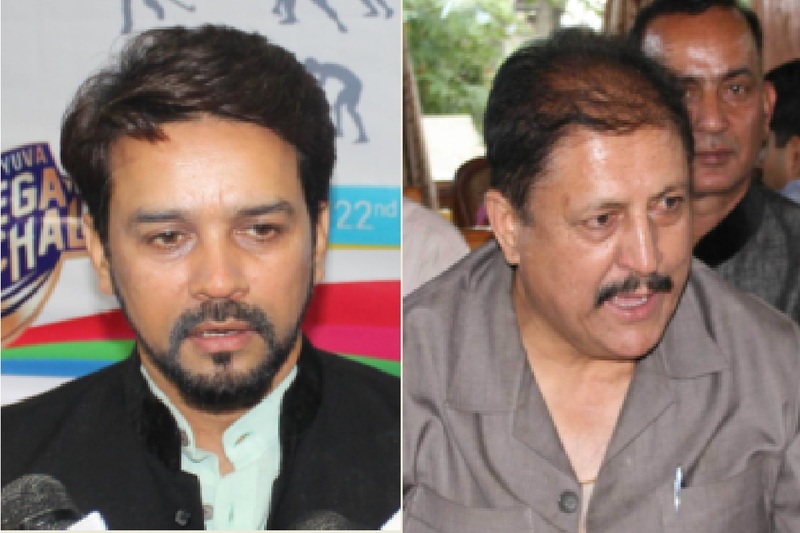 BJP insiders said sitting MP, Anurag Thakur has been campaigning for long, even before the declaration of the ticket on 23 March, while the Congress declared its candidate rather late (earlier this month). “Anurag Thakur has the advantage this time as the people in Hamirpur district are somehow feeling bad that Dhumal, a CM candidate, was defeated in Sujanpur. Let’s see, how it translates into votes. Since Anurag Thakur’s election would decide the fate of Dhumal family in Himachal politics, former CM, Dhumal is also working hard in the field for his son,” insiders said. In Congress, although there was much infighting over the candidate, the party’s decision to field Ram Lal Thakur has gone down well among the cadres in Hamirpur Parliamentary constituency. “Ram Lal Thakur is the best choice for Hamirpur. There was some delay in declaring the candidate but I think the party is catching up fast in the field,” said state Congress chief Kuldeep Singh Rathore. Congress insiders in Hamirpur said that among other factors, the party is also banking on anti-incumbency against three-time MP in row Anurag Thakur.